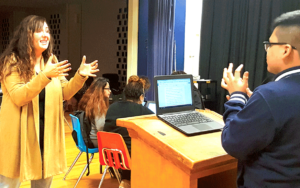 Each year, theater and drama teachers bring new experiences to their students and audiences alike, sharing thrill and adventure through the arts. They showcase plays, develop love for the arts in students and many other life skills. 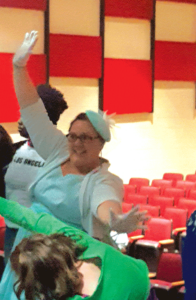 Meet two Chesterfield County teachers that bring their talents to two neighborhood middle schools with their own flair and commitment to theater and drama. Each is in her first year as a drama teacher in the area. This is Butela’s first year working at Falling Creek Middle School, and she’s pretty excited to be there. “We are currently working on starting a drama club here at the school,” she said. Butela splits her time between Falling Creek Middle School and Tomahawk Middle, so she keeps very busy. Butela is not new to teaching; she previously taught fourth grade before becoming a drama and theater teacher. She has a fine arts degree in theater from San Francisco State and her Master’s with a teaching degree from Salem College. Eden DiMarco was a godsend for Matoaca Middle School when they were looking for a new drama teacher for their arts program. An administrator shared that they were delighted to have her there. She and her students enjoy the magic of drama. They can be found in big circles dramatically portraying scenes from a reading. The students enjoy cutting up and laughing as they play out their scenes. “I am so grateful to be in a position where I can support and encourage young people to be their best possible selves,” DiMarco said. “I am so thankful for this position to be a positive influence on my students as well as to learn and grow myself through interactions with them.